Update 27/5: Good news! GRT is reinstating the Weber/Guelph stop to serve the midtown area and it will be back up by mid-next week. The Weber/Union stop will remain closed, as it sees additional service from route 8, and was less used than Weber/Guelph. It was also only about 500m away. There is concern about keeping the 200 on schedule, but it's encouraging to see responsiveness from GRT on this! I guess there was more than one crotchety blogger on the phone with them after all. For those of you who provided feedback about how you were affected, thank you. nce upon a time, there was a happy central neighbourhood called Mount Hope. In Mount Hope, being very central (directly between two great cities), Transit was present and available, as you might expect. Some residents in the neighbourhood chose to live there because of this, as they could travel the great Central Corridor through the Cities without needing a Car. But one day, the Great Road Eating Rail Monster came, and Transit ran far away. And the people of Mount Hope were sad. A little later, just as sad people in Mount Hope were trying to figure out how to live without Transit (likely by buying Cars to drive the few roads not being eaten), Transit came back again! In a different place, but still reachable to the residents of Mount Hope, and they breathed a great sigh of relief. Unfortunately, it was not to be for long. One day just a few months later, Transit went away again. The Central Corridor buses were to drive by, with strict orders to not stop for the poor people of Mount Hope. In its place, a different bus would come every now and then, once in a while on Saturdays and never at all on Sundays, and it would take people where it went, which was usually not where they wanted to go. And it would take people when it showed up, which was often not when people needed it, because it only came every now and then, only once in a while on Saturdays and never-- it was decreed, never! on Sundays. This was called "Transit", but the people of Mount Hope were not fooled. But they were once again sad-- not to mention, confused-- and they started browsing new car ads on the Internet because who can trust Transit that comes and goes? The Great Road Eating Rail Monster would eventually leave, having birthed a beautiful Train. But that Train would see fewer riders, because the people of Mount Hope were all driving the Cars they had to buy to get around while the Monster raged and Transit had proven too fickle and elusive to rely on. ... OK, so, not a great fairy tale. Let me explain. Once, Mount Hope had good access to transit, as the fairy tell told. The 4, marginally useful at the best of times, was rerouted to cover the cancelled 18. When the 200 iXpress detoured over to Weber because of ION construction, it didn't stop anywhere in between uptown and downtown, leaving a lot of riders in the lurch. 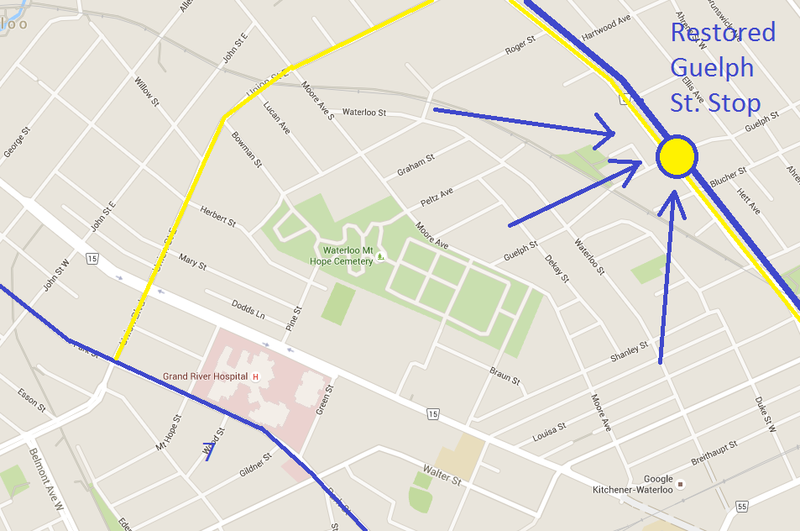 Simultaneously, route 7 shifted over to Park St., which was great for the Belmont neighbourhood. 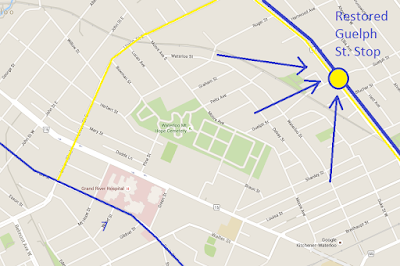 Simultaneously, the low-frequency route 6 turned off Wellington at Weber. But then, the 4 needed to be detoured as well! So to infill the 4 on Weber, GRT added stops for 200 iXpress (which runs every 10-15 minutes and has good Saturday and Sunday service) at Weber/Union and Weber/Guelph. This gave back good transit access to the Mount Hope neighbourhood. 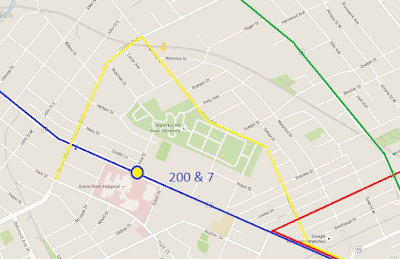 Now that the 4 is returned to its normal route, the 200 no longer stops at these locations. This is despite the fact it drives right by them, every 10-15 minutes. In fact, 200 iXpress travels for an astounding 3.5 km without stopping even once. From the north end of Uptown, all the way to King/Victoria. Certainly, Mount Hope isn't the only area affected by this-- Mary/Allen is, as is anyone in the Midtown area relying on the 200 to get them to points south of Fairview. But with all these changes put together, the Mount Hope neighbourhood is once again left like an island without transit, unless you count the occasional lonely route 4 bus. And very few people will count this for anything. Frequency matters, and routing matters. 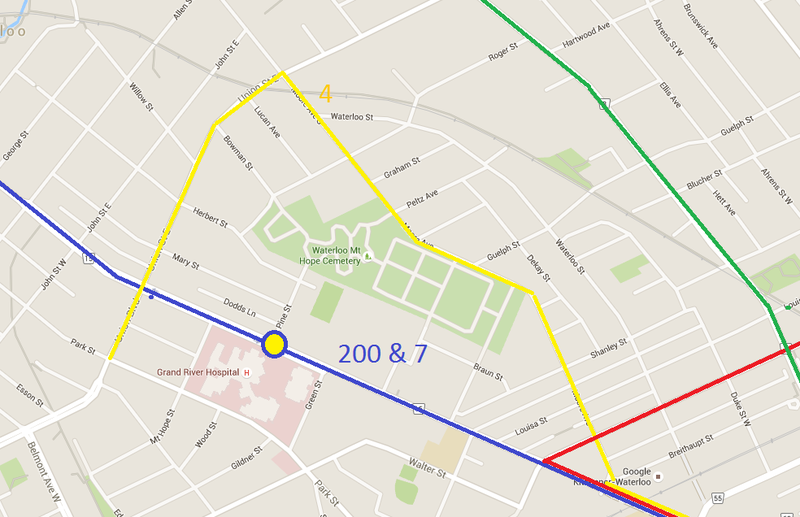 GRT has ignored these things when deciding the 200's detour. In 2015, GRT saw transit ridership fall for the second year in a row. Even accounting for changes to school student busing, and even with new service being added, GRT ridership still fell. 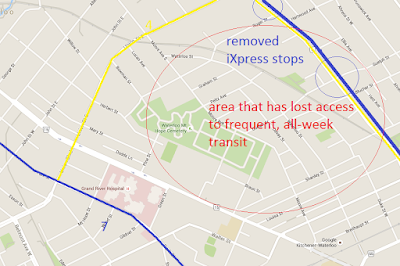 The problem with Mount Hope is just part of a larger issue affecting ridership, and that is the chaos and disruption of ION construction. But unlike a lot of the other aspects of this problem, this one can be solved easily and locally. In fact, the solution was already in place. All we have to do is return to it. 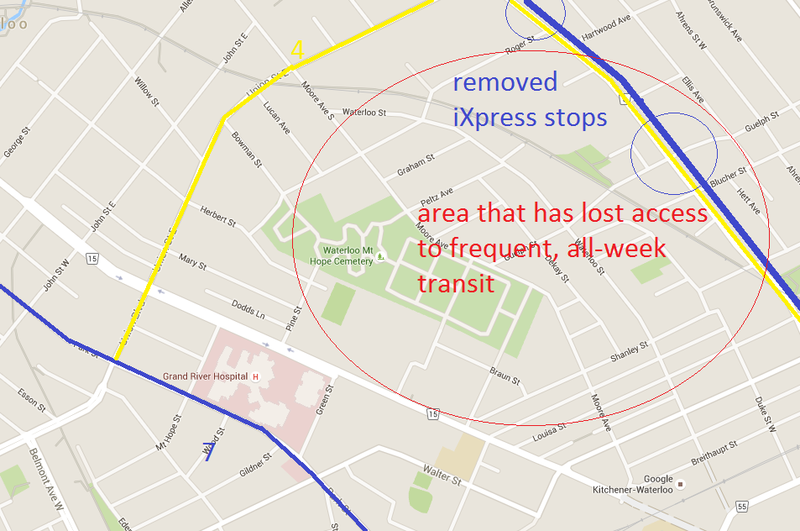 All we have to do is reintroduce stops at Weber/Guelph and Weber/Union for 200 iXpress. This is brutal. They are fencing us in!